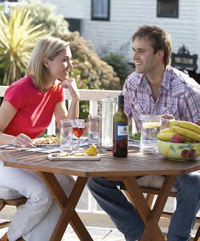 **** NEWS**** Southern Decks now offer Decking KITS - Standard Sizes or Made to Measure..... CALL NOW 023 9311 6938 to find out more. 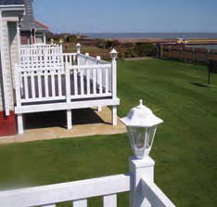 Order Now to avoid delays in high season.... Decking KITS!!! For more Customer Comments click here or on the link below! NEW OFFER!! We now offer Decking Kits - Standard or made to measure. Approved Professional Decking suppliers and installers, we specialise in plastic - vinyl - uPVC Decking for: Static Caravan Decking, Steps, Verandas, Sun Decks, Balconies and Skirting for: Lodges, Park Homes, Mobile Homes, as well as installing conventional timber garden decking. All your Static Caravan Decking needs! Call us for a free Quote now! 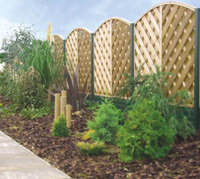 Decking Kits for self assembly or installationWe NOW offer a variety of high quality Standard and Bespoke Deckng kits. Call now to find out more or get a free quotation! 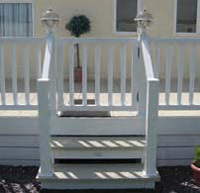 Static Caravan Decking Steps, Ramps, Gates and LightsAll our decks come with steps and gates where required. We also offer individual/replacemnent Steps and Gates. Vinyl uPVC Garden Decking...High Quality yet affordable decking solutions to last, maintenance free, just sit back and enjoy the view. Be the envy of your neighbours... 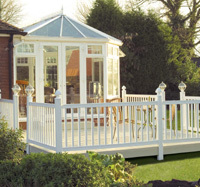 Choose the best decking solution to suit you, select from our range of hard wearing quality materials. Special Interests LOOK! We often get asked to build or advise on other products. So here is some interesting information which may help you with your NON-Decking needs... Please feel free to browse our offers of special interest. Wooden Sheds - amazing plans covering hundreds of designs simply.. Click Here! Greenhouses with amazing plans covering different styles Click Here! Carpentry- amazing Woodworking plans Click Here! or here Click Here! Chicken Coop- just Click Here! to get detailed information Or Try ... Click Here! Kids Play House to find out Click Here! Carpentry Secrets - just Click Here! 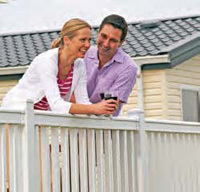 Why Choose Southern Decks Static Caravan Decking? 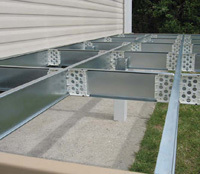 Buying a Deck is a major Investment, so you need to make sure you install the best! All our decking is approved by Liniar, the UKs foremost uPVC Decking Manufacturer. So you can be sure that our build quality and materials are second to none! - Slip Resistance has been Tested to BS7976;Part2:2002. Slip resistance was found to be good in both wet and dry conditions. See our new range of Composite Deck Boards - probably the most wood- like in the industry but with 0% wood equals 0 maintenance! *Where possible we will match or beat any valid quotation you have recieved! Call us now to find out how we can save you money! We Supply and Install: Vinyl, Decking on Caravans and in Gardens. Find out more - call us now! We also offer a free phone number to call us 0800 840 7421. Once we have provided you with our highly competitive Quote. Simply confirm your decision and we will arrange to deliver and Install your new Static Caravan Decking at your convenience! We offer a range of payment options to suit you.